Hhigh performance, low cost, C/C++ programmable controller. The B-Engine (BE) is a high performance, low cost, C/C++ programmable controller with ADC, DAC, Ethernet, CompactFlash, and 20+ I/Os. The ADC(AD7606) can accept ¡À10V or ¡À5V true bipolar analog signals while sampling at throughput rates up to 200 kSPS for all 8 analog inputs. Each analog input contains second-order antialising filter, sample-and-hold amplifier and clamp protection tolerant up to ¡À16.5V. With 1M ohm analog input impedance, a 7000V ESD rating, and sustaining up to ¡À10 mA input current, the analog inputs are designed to survive in a rough industrial environment. It is intended for networked industrial process control, power-line monitoring and protection, multiphase motor control, high-speed data acquisition. 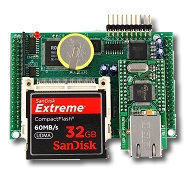 With its high reliability and low cost, it is ideal for industrial OEM applications.